Dubai is a mind-boggling kind of place. Don’t believe me? Look at a photo of Dubai from 1990, and you’ll see a desert wasteland. Today, it’s one of the most dynamic cities on the planet. Not enough beachfront property? No problem, they built artificial islands in the shape of a palm leaf and another archipelago in the shape of the world. And the building doesn’t stop there. Tallest skyscraper in the world? Check. One of the tallest and most expensive hotels in the world? Check. 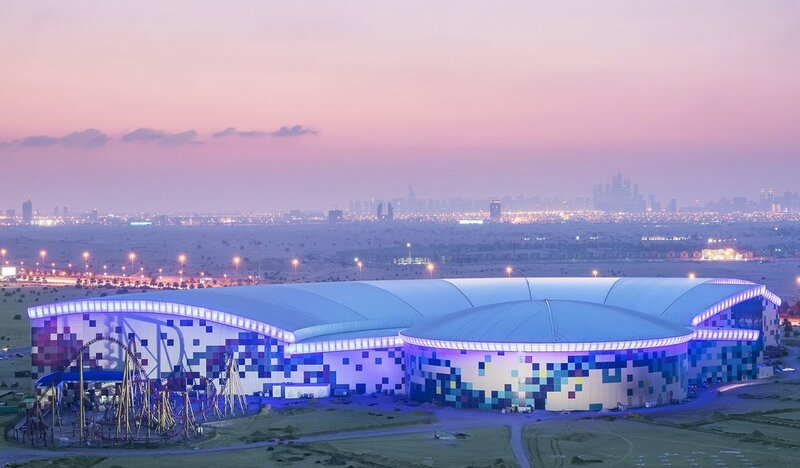 The largest collection of theme parks in the Middle East (aka Dubai Parks and Resorts)? Check. If you’re looking for the soul of the Middle East, you won’t find it in Dubai. But if your family is looking for a fun-filled vacation destination that defies the imagination, book your tickets now. According to His Highness Sheikh Mohammed bin Rashid Al Maktoum, the ruler of Dubai, bigger is better. No apologies. So it should come as no surprise that the world’s tallest building, Burj Khalifa, towers above the one of the world’s largest mall, Dubai Mall. At 2,717-feet, Burj Khalifa pushes architecture and engineering to new heights. The view from the observation deck - 124 floors up - is astounding. For nearly double the price, you can head to At the Top at level 125 and 148, but to my mind, it’s not worth the extra expense. If you can time it correctly, a sunrise or sunset visit only adds to the experience. After the tower, you can people watch at Dubai Mall which includes an aquarium, ice rink, indoor taxis, and the dancing fountains. Burj Khalifa cost: Youth (4-12) starts at $26; Adult starts at $34; reserve tickets online for better availability. 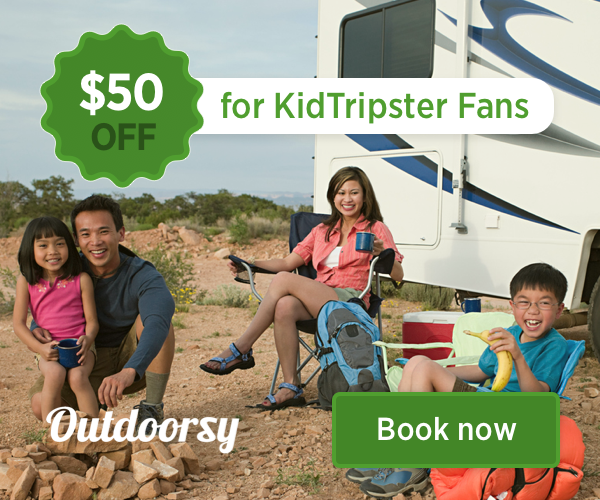 KidTripster Tip: Bring your camera. They’ve removed part of the glass on the observation desk, so it's possible to get unobstructed photos of the city below. There are no shortage of extreme activities in Dubai, but I think that XLine is the most family-friendly. 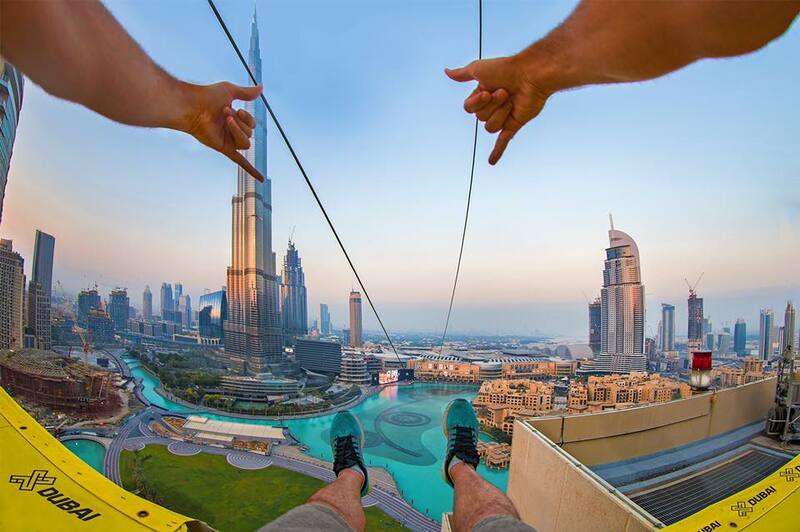 It’s a urban zipline, where you leap from nearly 300 feet off the W1 Tower in downtown Dubai and sail over the Dubai Fountains, all the while taking in magnificent views of the Burj Khalifa. Participants need to be at least 11 years old, weigh 110 to 242 pounds, and be at least 4-1/2-feet tall; kids also need to be accompanied by their parents. If you have a thrill-seeking teen in your family, XLine is an unforgettable experience, but it ain’t cheap! Cost: $163/person; purchase tickets at XLine kiosk in Dubai Mall, ground level next to Social House. Dubai boasts several waterparks, and while Wild Wadi is older, it’s my family’s favorite. It has a wider array of slides and better services (like being able to charge food on your wristband, so that you don’t have to carry wet cash). On-site ticket and food prices are less expensive at Wild Wadi; towel and locker rentals are available. Cost: Youth (under 3') $63; Adults (over 3') $75; if you’re a guest at the Jumeirah Hotels, admission is free. KidTripster Tip: Bring your camera to Wild Wadi. It’s one of the best vantage points to get photos of Burj al Arab Jumeirah, one of the world’s most luxurious hotels. When you’re not using it, you can store your camera in a rented locker. KidTripster Tip: Consider admiring Burj al Arab Jumeirah from afar. Rooms start at $1200+/night. And you can’t just walk in. You either have to be a guest or have a reservation for lunch/tea/dinner. Just for tea, it’s about $108/person! Instead take a peek here. 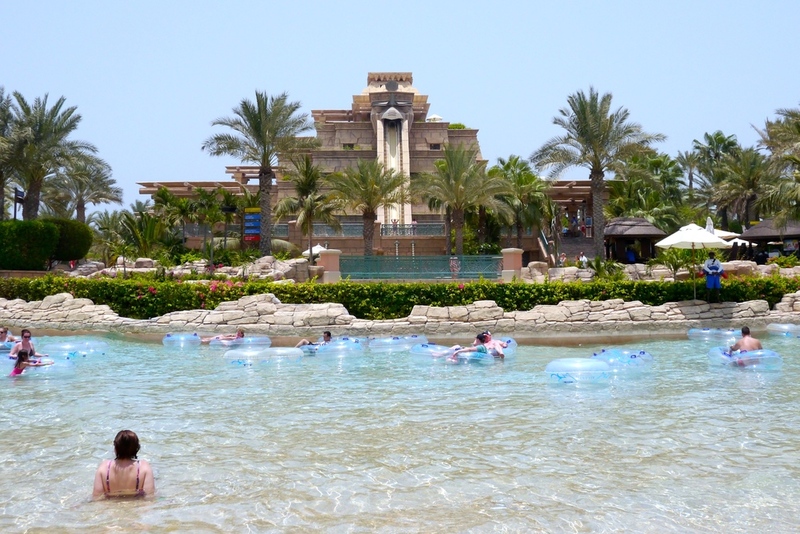 If you have the time, head to Aquaventure Waterpark at Atlantis The Palm Hotel on The Palm Jumeirah. This park is home to the most terrifying water ride that I’ve ever forced myself to go down, called Leap of Faith. It’s a four-story slide that drops you nearly straight down. My sons went down this slide several times; me… just once. Aquaventure also has access to the beach along the Arabian Gulf. You likely won’t swim there; it’s like dipping your toes in bath water. Towel and locker rentals are available. Cost: Youth (under 4') $59 online; Adult (over 4') $70 online; tickets are more expensive when purchased at park. KidTripster Tip: Wear flip flops at the waterparks. With the intense heat, you’ll find the sidewalks extremely hot on your bare feet. Mall of the Emirates is one of several mega malls in Dubai. Because of the intense sweltering heat, malls really serve as city parks for locals. The stores are expensive, but the people watching here is free. This mall is also home to Ski Dubai, the first indoor ski resort in the Middle East. I recommend watching the show Extreme Engineering to see how it was built. We found the process to be more impressive than the actual ski hill, but granted, we live near real snow-capped mountains. For a price, you can ski, snowboard, tube or visit the resident King Penguins. We were satisfied to look through the glass. Cost for all-exclusive pass: $139/person; rentals and snow gear available. Take advantage of this rare opportunity to visit Grand Jumeirah Mosque, the only mosque in Dubai that allows non-Muslims to enter. The Sheikh Mohammed Centre for Cultural Understanding hosts visits six days a week (Saturday through Thursday) at 10:00 a.m. (You don’t need a reservation, but you must arrive at the main entrance 15 minutes in advance.) The 75-minute tour, which is limited to one main room, is probably too long for younger children. It explains the pillars of the Islamic faith; the guide encourages you to take photos and ask questions. A meal is served on some days. Cost: Youth (12 & under free); Adults $5; including water, dates, coffee, tea, and traditional pastries. KidTripster Tip: Modest dress is preferred, however traditional attire can be borrowed from the Mosque. All women must cover their heads. If you tire of the glitz and glamour of Dubai, spend an hour in Old Dubai which harkens back to the city’s past as a small seaside trading post. Take the short trip across Dubai Creek between the Bur Dubai (south side) and the Deira (north side) via a small, motorized wooden boat called an abra. Ask your taxi drive to drop you at Bur Dubai Abra Station and then pay the fare to ride to Deira Old Souk Abra Station and visit the Spice Souk. Alternatively, you could skip the abra and just head to the Old Souk. Souks are small shops clustered together, selling spices, herbs, and handicrafts. Cost for abra: less than $1 (cheapest thing you’ll find in Dubai). KidTripster Tip: If you can, go in the morning before the oppressive heat of the day. KidTripster Tip: A visit to the souks is best combined with a visit to the Grand Jumeriah Mosque, as they’re both in the same part of the city. 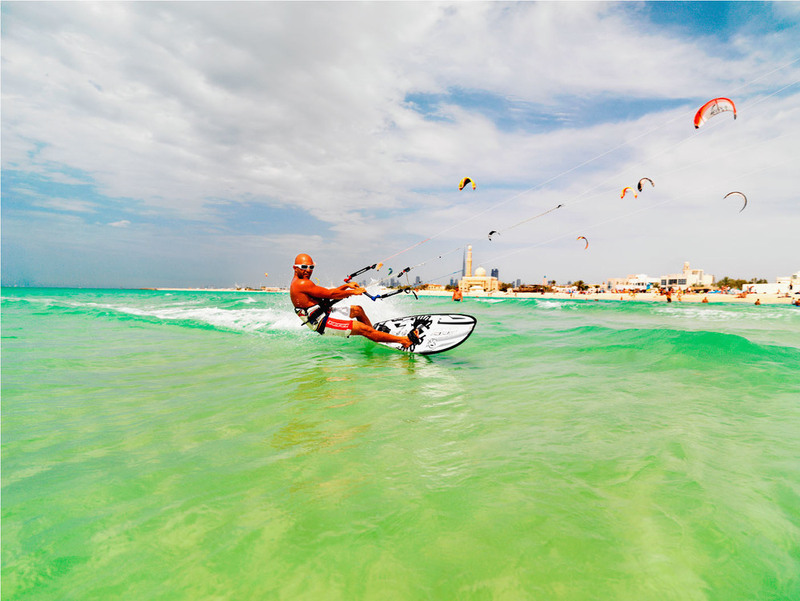 If you’re looking for the beach scene in Dubai, you’ll find it on Kite Beach. The beach is divided into two parts. There’s one area for families with clean sand, clear water, and a play area and skate park; there’s another area for windsurfers. Enjoy views of both the Burj al Arab Jumeirah and Burj Khalifa here as well as lots of people watching; the bikini-clad beachgoers are most likely ex-pats or tourists. Beach loungers and umbrellas are available to rent. There’s also a boardwalk for strolling and a nice selection of restaurants for a meal or snack. KidTripster Tip: While the windsurfers are fun to watch, they are not watching for your kids. Try to stay out of their way. KidTripster Tip: If you want the beach to yourself, go during the week. 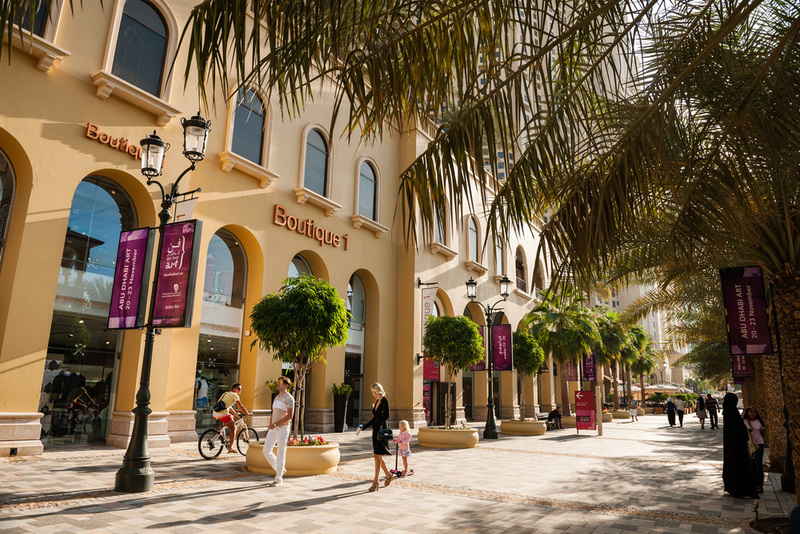 If you’re looking to burn off some kid energy, head to JBR (Jumeirah Beach Residences), formerly The Walk, a trendy shopping-dining-entertainment area along the waterfront. There’s chic boutiques, handicraft shops, and over 30 types of cuisine served al fresco, as well as street performers to entertain the kids. It’s a popular spot for strolling families, especially on Thursday and Friday nights. Dubai Parks and Resorts is one of the largest multi-themed entertainment destinations in the world. In addition to LEGOLAND and LEGOLAND Water Park, the resort features two additional theme parks, Motiongate Dubai (a Hollywood-inspired theme park) and Bollywood Parks, plus Polynesian-themed Lapita Hotel. Each of the parks has a separate entrance fee, though you can purchases a LEGOLAND combination ticket. Cost: Varies. IMG Worlds of Adventure is the biggest indoor theme park in the world. The rides here are Marvel and Cartoon Network-themed along with a Lost Valley Dinosaur Adventure Zone. This place is a good option on a sweltering summer day. Cost: Youth (under 3' & 3 years old) Free; Youth (under 4') $68; Adult $82. Several companies offer desert experiences. In addition to no-thrill dune bashing (dune rides), there’s sand skiing (think snowboarding but on a sand dune… way too hot), ATVing (too hot), camel rides (again, too hot), and desert dinners (you get the idea!). In my opinion, none of the experiences are worth the money. Frankly, the desert isn’t all that exciting; it’s sandy and hot. Enough said. For Top 10 Stays in Dubai, click here. Editor Shellie Bailey-Shah and her sons traveling to Dubai in the heat of July. It was so hot that their sunglasses instantly fogged up every time that they stepped outdoors.